is a form of extractive metallurgy; its main use is to produce a metal from its ore. This includes production of silver, iron, copper and other base metals from their ores. Smelting uses heat and a chemical reducing agent to decompose the ore, driving off other elements as gasses or slag and leaving just the metal behind. As most ores are impure, it is often necessary to use flux, such as limestone, to remove the accompanying rock gangue as slag. 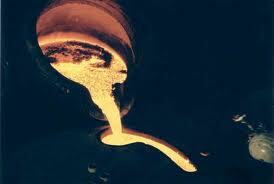 The end product is molten metal which can be poured into chills and solidified as ingots.